Second Road, 2016, Timothy C. Ely. Drum leaf binding, full leather, watercolor, dry pigments, gold and ink on paper. All images in this post courtesy of the artist. A love of books, the ancient art of handmade book-making, unusual materials, and universal mysteries unite renowned book artists Timothy C. Ely and Daniel Kelm. They live on opposite coasts, Ely in a small town in eastern Washington and Kelm in Easthampton, Massachusetts, although in the 1990s, they collaborated on a series of books called Investigations: The Four Elements focusing on sacred geometry and alchemy as related to earth, wind, fire, and air. Both artists have devoted themselves to work that may, in an average year, involve such processes as drawing, painting, gilding, geometry, sewing, rune-writing, leatherwork, melting wax, stone cutting, woodworking, and soldering. 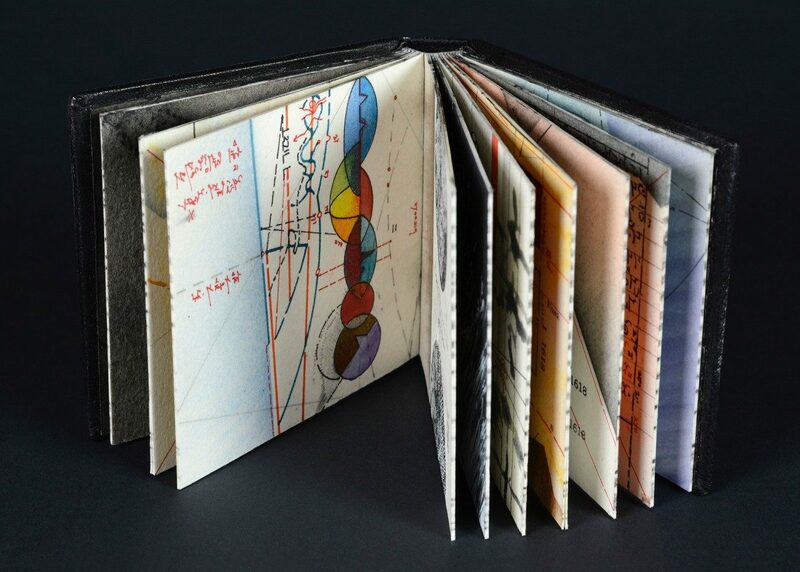 Ely studied design and printmaking and has been making books for over forty years. (He also owns sixty books on baking bread, his other passion that relies on precision and a bit of alchemical magic.) 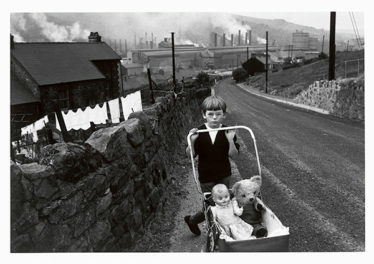 He has shown his work at museums around the country and it is in many private and public collections. 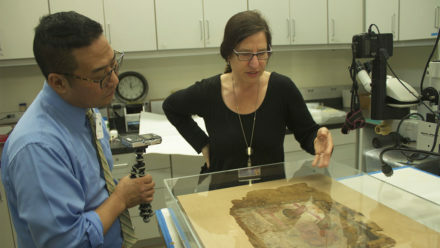 Ely and Kelm arrive at the Getty this month to give a lecture on the role of alchemy in their work. Ely will also lead a workshop on manuscript making. I spoke to them about their highly unique artistic practices. Part 1 with Ely is below, with Kelm’s to follow later today in part 2. Lyra Kilston: Do you have a favorite rare or ancient book? Have you been able to see it in person? Timothy Ely: The Gutenberg forty-two-line Bible, which I saw in New York’s public library. I have handled this book, and revel in the idea that it is a point on the historical timeline where we switched over from the book as a handmade ideal to an industrial product. My work is embedded in the ideas of pre-Gutenberg technology, with as much of the production being done by hand and the content generated by long contemplation and the intuitive handling of method. Timothy C. Ely’s studio, 2016. You work with fascinating materials, like animal skin bindings and nineteenth-century paints. What are a couple of your favorite materials to work with? Is there a material that you’d love to work with, but it’s too rare or obsolete? I envision making a large vellum book using a contemporary variant on an old technology. I have a vellum model in the works which has been in the press for sixteen years. Vellum is expensive and requires much animal husbandry to provide foliation for the artist. This book-to-be needs patronage. 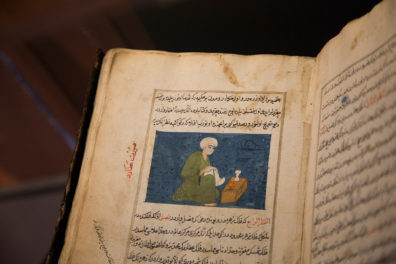 Other favorites are rare pigments made of materials from obscure locations. Not so much for what they materially do but what associations are formed. Meteoric dust (I have some from a meteor that fell around the time of Columbus), sand from Asian deserts, soil from the gardens of bookbinders and monasteries. My collection is vast and my spies numerous. This material adds form to covers but on occasion finds its way into the interior. 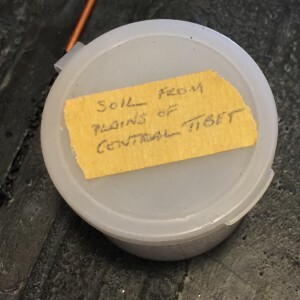 Soil from the plains of Central Tibet, one of many unique materials in Ely’s studio. Your work takes inspiration from a range of sources, from ancient runes to science fiction to the spiral pattern on a pine cone. What themes have you been working with recently? I am attempting to render the invisible, to describe some ideas like 4-D architectural renderings and diagrams of the ineffable. By using well-tested ideas such as symbolic visual descriptions, I can make an foray into how we might imagine the path of a particle or a hunch. My process is to draw, fail, evaluate, draw again, erase, redraw, abandon hope, find the path again, read something, draw more, melt something or hammer it together, fuse things, make some bread, draw again, and continue to see what shows up. Often up, sometimes down—it is never a linear process, but one that works by continuing to work with purpose against a plane which cannot easily be scaled. 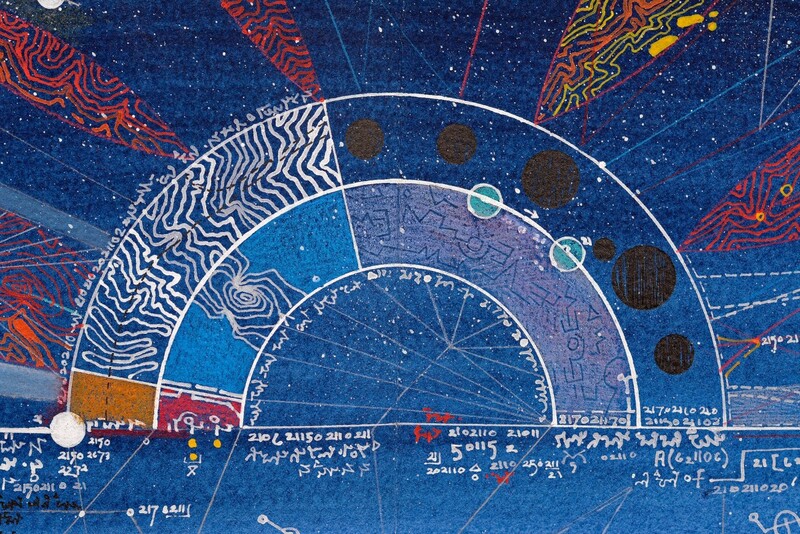 The Observatory, 2006, Timothy C. Ely. Ink, gouache, and dry pigment on paper. Endlessly interesting work and thoughts; cerebral, celestial, and an intrinsic part of each of us.